With 227 inhabited islands, surrounded by crystal clear waters and offering world class beaches and landscapes, it is only natural that Greece was one of the first holiday destinations when mass tourism started a few decades ago. Some islands became so popular that their entire economies are now centred on the tourist trade. However, there are others that have only been ‘discovered’ as holiday destinations - even by the Greeks - in recent years. Although the generalised term “Greek Islands’ brings to mind one particular kind of holiday, every single one of them has its own distinct character. Some are rocky, others green. Some are mountainous, others flat. Many are infamous for their nightlife, while others are renowned for their tranquility and relaxed lifestyle. Quite a few cater to high-end tourism and exclusive crowds, while there are islands that attract young and alternative types. A top ten list can never be exhaustive by any means, and you can only discover your own personal paradise by trial and error. 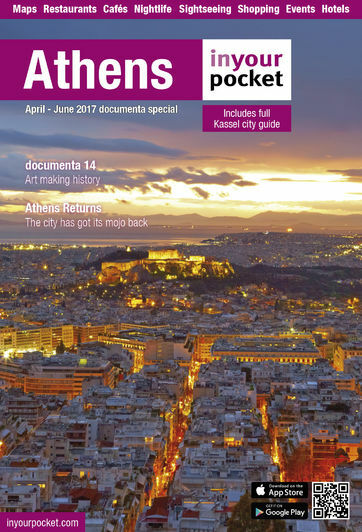 In this issue we present ten of the most popular islands, a beginner’s list of classic Greek destinations. To balance the scales, in our next issue we will publish a list of 10 little known or even undiscovered ‘gems’ for readers who prefer offbeat and unconventional destinations. If you’re going to visit only one Greek island in your life then let it be Santorini. Breathtaking volcanic views and one of the best sunsets in the world consistently place it at the top of any Greek islands list. Its beaches are very peculiar (and do not appeal to everyone) due to the black and red volcanic sand. Couples should opt for tranquil and romantic Oia, where luxury rooms with a Caldera (the volcanic crater) view can cost a forune, whereas those young at heart should choose Fira, the lively capital of the island built on top of the Caldera cliff with equally fantastic views. The eastern side of the island is generally cheaper and has little of the magic Santorini feel. The largest Greek island, Crete has a distinct local culture and will satisfy whatever it is you’re looking for. Busy touristy resorts, wonderful old towns like Chania and Rethymno, amazing deserted beaches even in August (especialy on the south coast), unspoiled mountain villages with people utouched by the tourism ‘gold fever’, and the best food by far among all Greek islands. It is a trecker’s paradise, with top attraction the challenging Samaria Gorge and one of the highest mountains in the country Idi (locally known as Psiloritis). It is imposible to ‘do’ Crete in one visit so try to concentrate either on the East (based around Agios Nikolaos) or West (based at Chania or Rethymno). A car is neccesary in any case. A cross between Capri and Ibiza (in its good days) but with a very cycladic feel, Mykonos boasts of the best beaches in the country, the craziest nightlife and the most ridiculous prices you’ll pay in Greece. Celebrities, gay, and wannabes flood the island every summer. They sunbathe their days away on their pre-booked sunbeds and the nights squeezing pass each other in the narrow streets of the picturesque village, moving between bars and clubs. Bring along the best pieces of your wardrobe (preferably white), all your energy and credit cards. The fact that world famous Japanese restaurant Nobu set up shop first in Mykonos and a few years later in Athens says a lot about the kind of holiday you should expect here. Just an hour and fifteen minutes from Piraeus, Hydra is one of the prettiest Greek islands with a unique architechture that has been preserved due to a strict development policy. Large houses belonging to historic figures loom on the hills on both sides of the picturesque harbour and there is a total car and motorbike ban on the island. Instead, mules lining up with their owners untertake all the transportation burdens of locals and visitors (and litter the narrow cobbled streets). To go to one of the sandy beaches of the island, one must hire a sea-taxi, but the deep blue waters just off the harbour are where most people go to swim. Nightlife is basic but adequate for a relaxing holiday. Louis De Bernières has done for Cephalonia what the best PR consultant wouldn’t even begin to imagine with his wonderful novel and worldwide best seller ‘Captain Corelli’s Mandolin’ (Amazon £5.99) which is set on the island. And when the film came out a few years later the natural beauty and the sapphire waters of Cephalonia were advertised on screen too and its tourism fortunes were turned upside down overnight. Myrtos is the most famous of its beaches, but there is a plethora of things to do and wonderful nature to appreciate away from the coast too. Argostoli and Lixouri are the two (rival) main towns, while Fiscardo and Sami (the village where the film was set) are well worth visiting. Probably the most typical of the Greek islands and a convenient base for island hoping around the Cyclades due to its excellent ferry connections. The beaches, the nightlife and the accomodation choice are all above average and many holiday makers return year after year. Parikia with its lovely old town is the capital and the port of Paros, but most nightlife is concentrated in piqturesque Naousa. Regular international windsurfing competitions are held at noisy Chrysi Akti beach but you can easily find quiet and isolated beaches if all you want is to relax and enjoy the blue waters. And if really quiet holidays are more up your street, Antiparos is the tiny and alternative neighbour just minutes away on a local boat. A northern Ionian island with a mixture of influences ranging from the Venetians to the French, Italian and British (the only place in Grecce that you can watch locals playing a cricket game and drinking ginger ale!). The old town with the two fortresses is an UNESCO world cultural heritage site and the nature one of the best you can find on any Greek island. Fine beaches with freezing cold waters on the eastern side attract thousands of visitors every summer and as in every large tourism-orientated Greek island the range of holidays one can enjoy is vast. Unlike the Cyclades, Skiathos and its neighbouring Sporades complex are flooded with pine trees that reach the sea and surround its numerous sandy beaches, like Koukounaries, one of the pretiest and busiest in the country. Hora, the capital of the island is an idyllic village with red-roofed white houses built on a hillside sourounding the harbour. An ideal destination for families and those not attracted by the harsh and rocky natural beauty of the islands of southern Aegean. Easy access to the rest of the Sporades, Skopelos, Skyros and Alonissos, makes a local island hopping possible. Once home to one of the seven wonders of the world the ‘Colossus’, Rhodes is one of the earliest holiday destinations in the country. It is marked by the wonderful Medieval old town, another UNESCO world herritage site. Most holiday makers arrive on charter flights as the ferry from Piraeus can take many hours, and they have a good choice of resorts on the island, ranging from the top all-inclusive five star hotels to downright ‘sun ‘n booze’ holidays. There is plenty of sightseeing to do, and a number of museums to give you that cultural alibi between your long days on the fine beaches and the long nights out. The alternative corner of the Aegean during the 70s and 80s. Its fans have grown up now and have proper jobs but something of the atmosphere of those days is still preserved on the island. The whitewashed houses of Hora, its main village, hide a frenetic but not high quality nightlife, that you’ll appreciate more if you are under 25. Its beaches though, are at par with the best in Cyclades and indeed the whole country (Ios and in particular the isolated beach of Manganari is the favourite summer destination of Prime Minister Karamanlis). If you suddenly feel too old for the exhausting pace of the place, you are only a short ferry ride away from Santorini.